A 180ft vertical drop into a dark hole... Don't Look Down. Opened in 1998, Oblivion was anticipated to be the world's most intense and nerve shattering ride. Needless to say, those who followed the development and construction of the ride were not disappointed! In 1998 X-Sector opened, home to Enterprise, Black Hole, Energiser, and its newest addition: Oblivion. This menacing steel giant attracted attention from press and guests the world over, who all flocked to Alton Towers to experience the vertical free-fall into Oblivion. Whilst boasting claims to the title of "World's First Vertical Drop Rollercoaster" Oblivion is actually at an angle of 87.5 degrees, and not 90 degrees. However, don't take this lightly as it is still one of the most terrifying rides you will ever encounter! 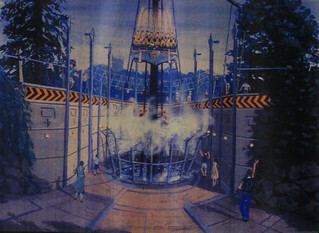 Oblivion hasn't been without its controversy however, with a noise abatement order being imposed on the operation of the ride resulting in the 'top of the drop' on ride audio "don't look down" having to be removed. Also, 2011 saw the introduction of Fanta sponsorship, which many felt detracted from the rides theme, with slogans such as "Looking Down Is The Fun Part" and "More Fanta, Less Serious". The more noticeable posters and wall coverings from the sponsorship were removed from the ride and its area a few months later, following numerous complaints about the obtrusive nature of the brand. For the 2013 season Oblivion was given a new coat of paint and a deep clean, ready for the opening of X-Sector's newest resident, The Smiler.